When people think of Munich, the images that might immediately come to mind are men wearing lederhosen, the festival of Oktoberfest, and of course, sausages and beer. And while our recent visit to Munich confirmed all this to be true (thank goodness! ), there is so much more to see and do outside of these wonderfully delicious stereotypes. 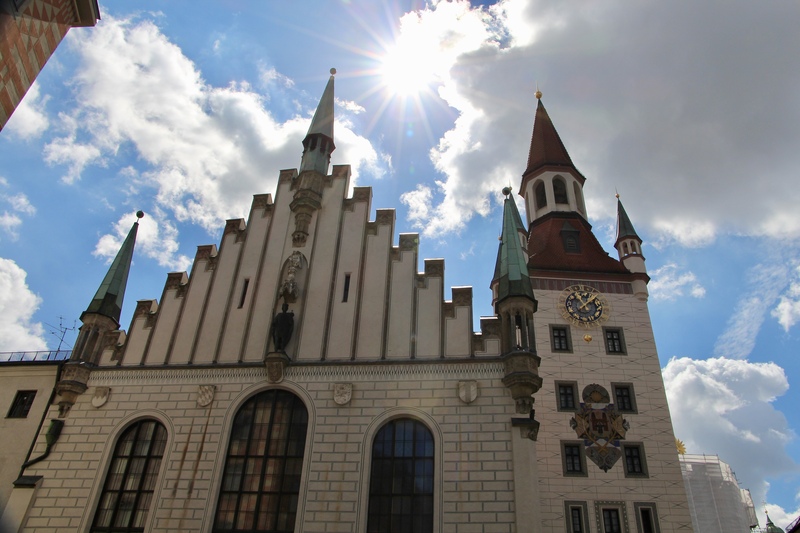 Munich is a perfect city to use as a base to explore, not only the city itself, but the whole state of Bavaria. It’s small – with all major attractions and experiences located in and around the old city centre. The main train station, München Hauptbahnhof, is also right in the centre of the city. It’s a great place to set up and spend a longer period of time – there’s so much to explore! 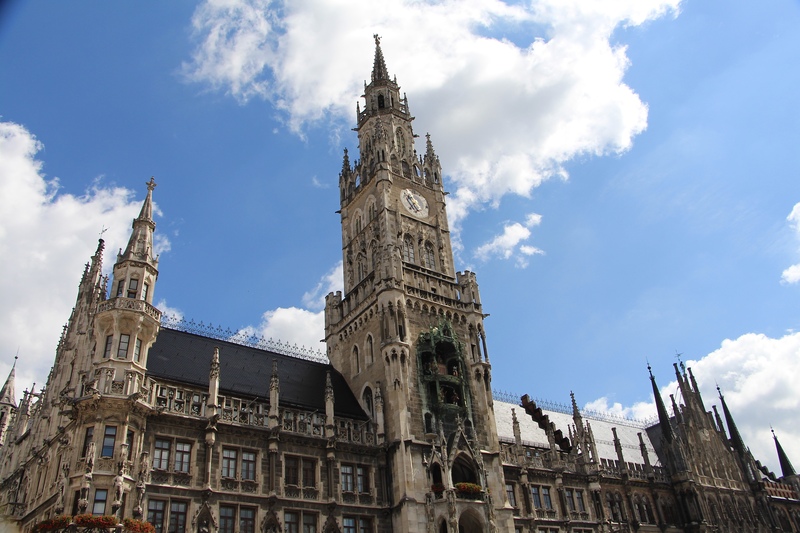 Soak in the beauty of Marienplatz, Munich’s main square in the centre of the old city. 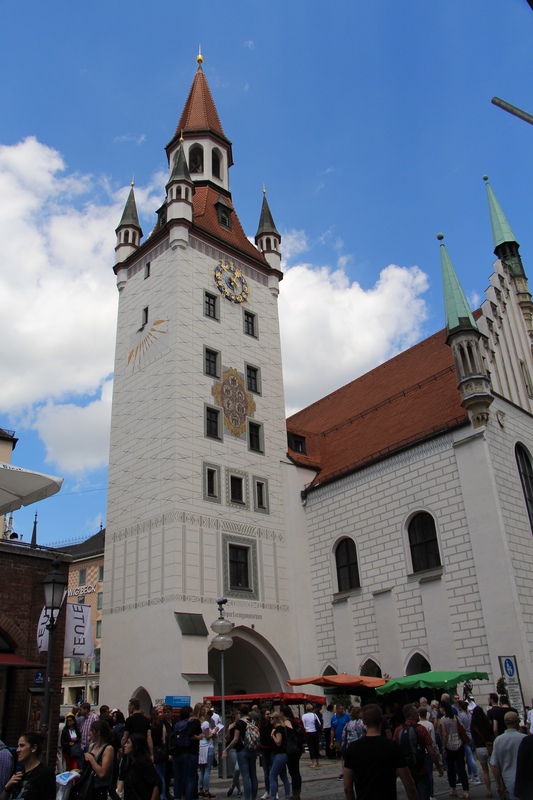 Here you’ll find the Neues Rathaus (Town Hall). Be sure to arrive on the hour to glimpse it’s glockenspiel come to life with a show that chimes and reenacts stories from centuries past. Kick back and drink beer in one of Munich’s many outdoor beer gardens. 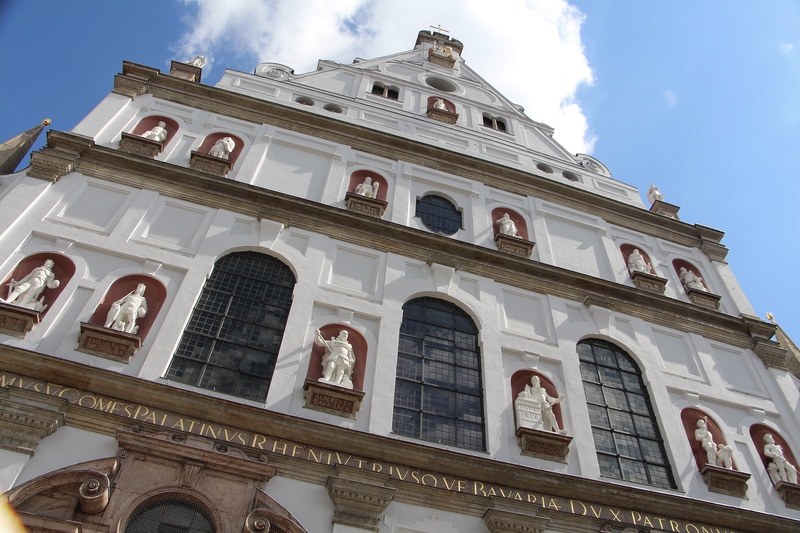 This is a must-do in Munich, and you must do it as often as you can. You’ll meet some great people if sharing a table, and the atmosphere is relaxed and casual. This is the best way to spend a sunny afternoon in Munich. 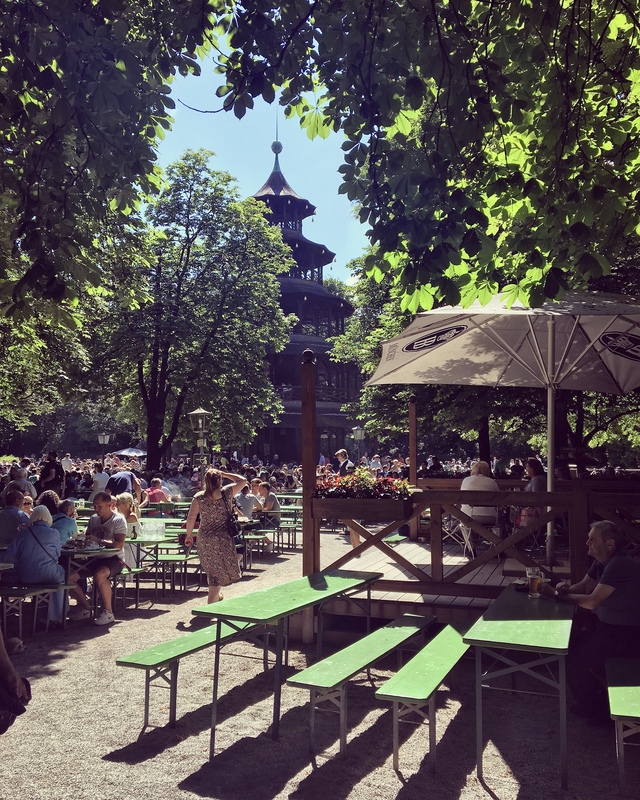 I recommend the beer garden at the Viktualienmarkt in the centre of Munich, the Chinesischer Turm (Chinese Tower) in the Englischer Garten, and Augustiner Keller. Another popular garden is the Hirschgarten. And remember, proper Beer Garden etiquette dictates that, if you come upon a table already occupied by someone else, you must ask that person before sitting down. Never assume. 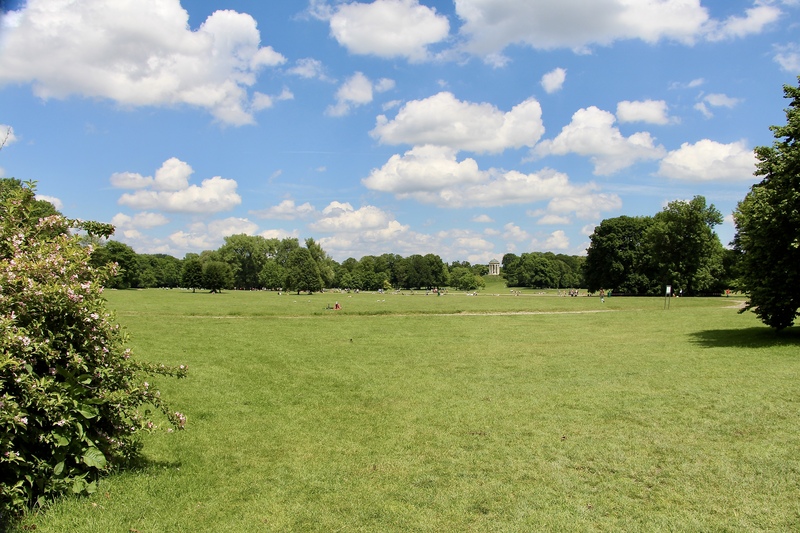 Spend a morning or afternoon strolling through the Englischer Garten. 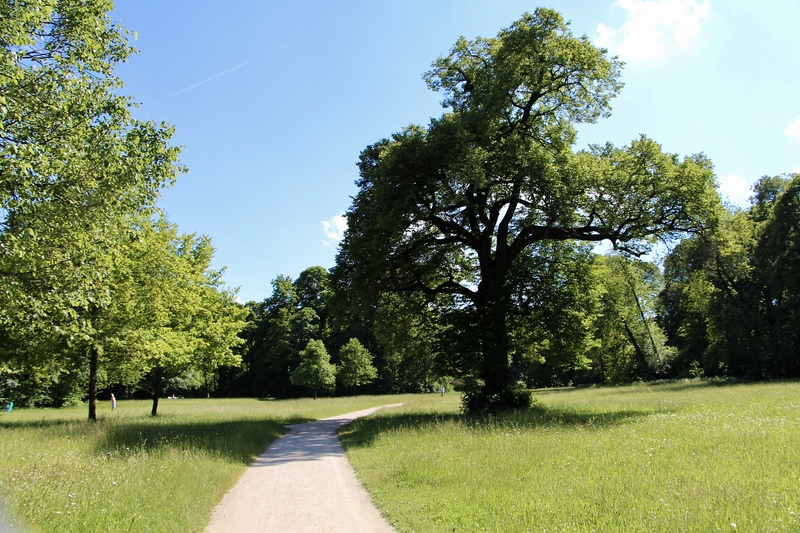 It’s a beautiful, expansive green space in Munich. 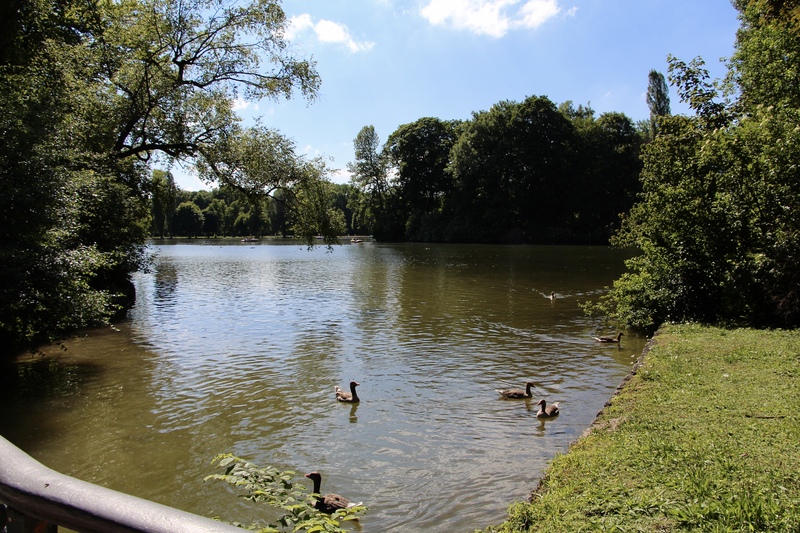 In the warm summer months, it feels like all of Munich flocks to this park for swimming, cycling, drinking, relaxing in the sun, and surfing. Yes… surfing. Marvel in the shadow of the impressive Frauenkirche, and climb to the top of the tower of Peterskirche for wonderful views of Munich. 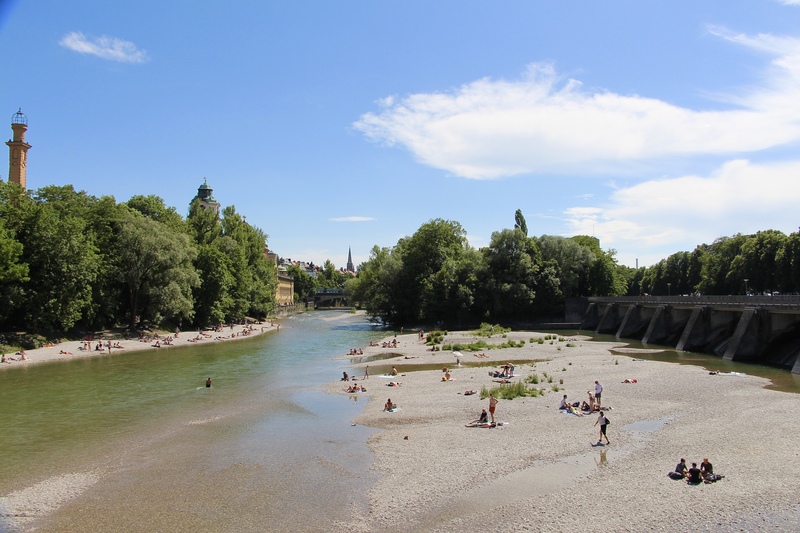 Do as the locals do and take a picnic on the banks of the Isar River. 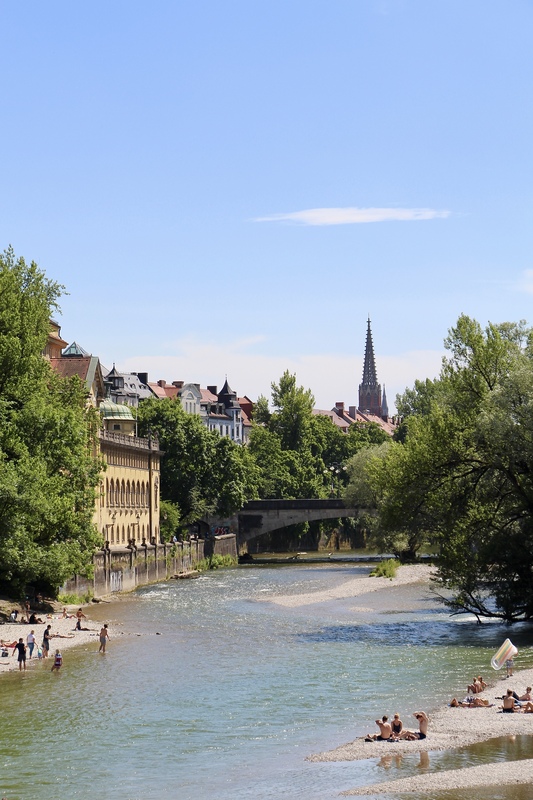 The Isar is a beautiful river that winds through many of Munich’s public parks. 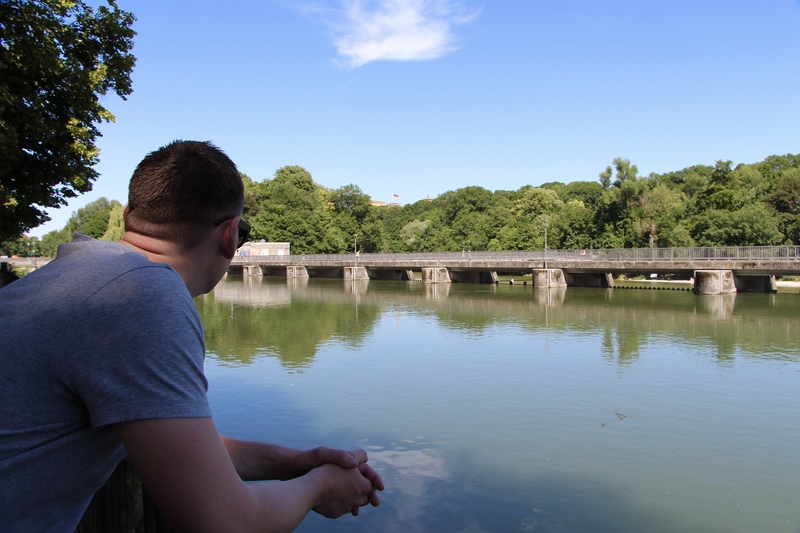 It’s common to swim in the Isar, and kick back on it’s banks with food, drink and good company. 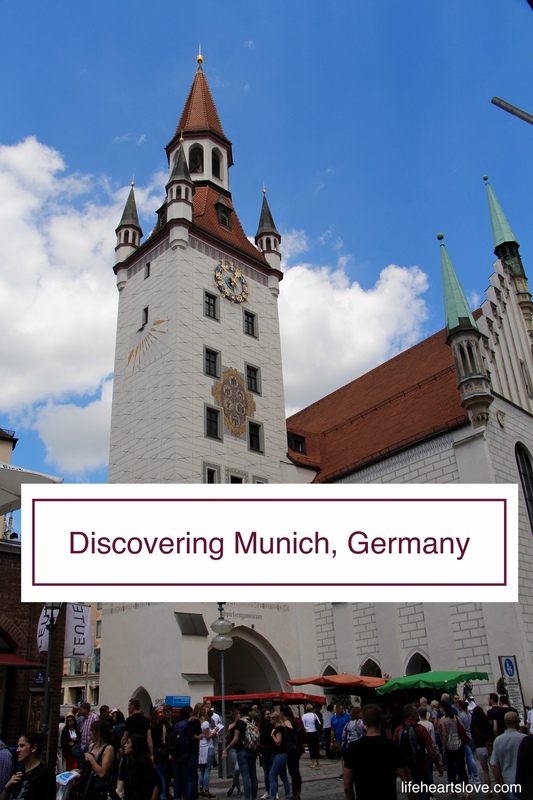 Book a free walking tour, or just wander the streets of Munich yourself to soak in the atmosphere and architecture that makes up this charming city. When it comes to museums, Munich has a little bit of everything. If science and technology is your passion, you’ll find it at Munich’s Deutsches Museum. If you’re a car enthusiast, you might enjoy the BMW Museum. And, if you’re like Scott and I, and came to Munich first and foremost for the beer, there’s the Beer and Oktoberfest Museum. Visit Nymphenburg Palace and explore it’s beautiful baroque gardens. And of course, if you’re visiting Munich in late September/early October, it’s likely because you’re planning to visit Oktoberfest – the worlds largest folk, and lets face it, beer drinking festival there is. Oktoberfest is an experience worthy of the bucket list. It’s on mine, and someday I’ll return to Munich to slip on a dirndl, drink beer, and polka dance my pants off! 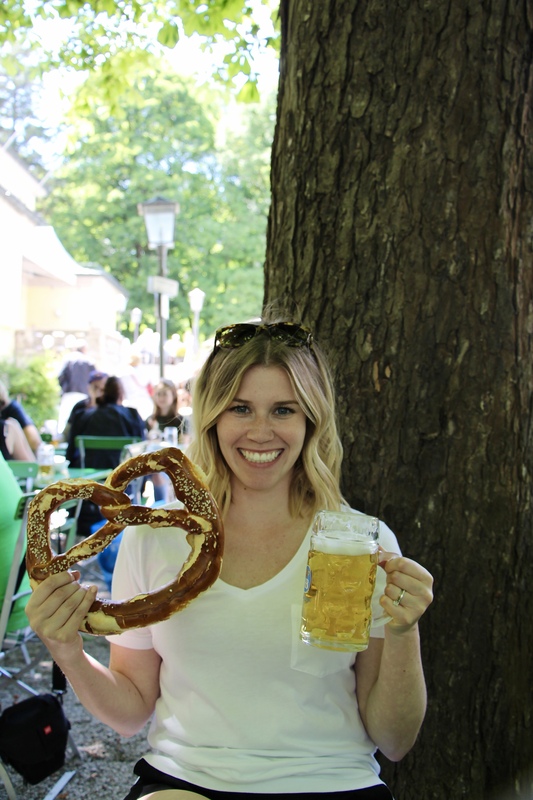 If I’m being honest, the two things I loved most about Munich was the food I ate, and the beer I drank. The culture throughout Munich is unlike anywhere else, and our afternoons spent sipping cold beer in the gardens will go down as some of the very best. 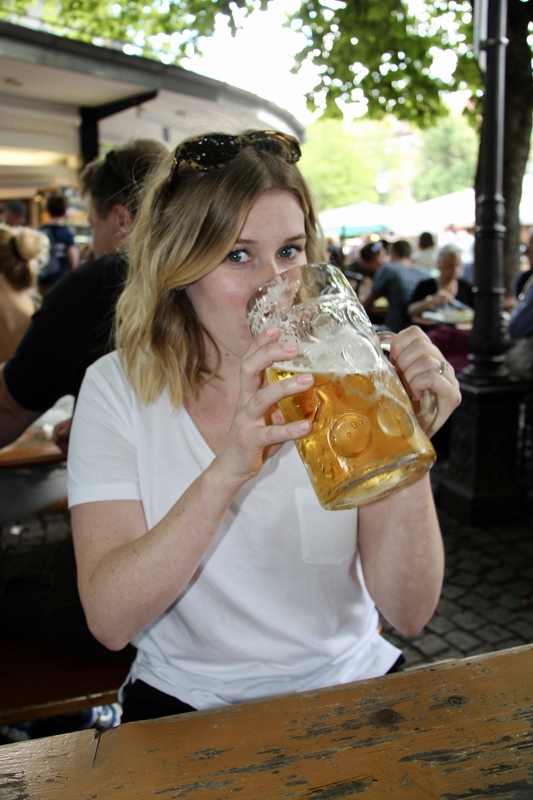 Above all else, the best advise I can give is plain and simple… drink beer in Munich. There are six major breweries that dominate in Munich: Löwenbräu, Hofbräu, Augustinerbräu, Paulaner, Hacker-Pschorr and Spaten. All these breweries offer delicious beer, but the true winner (in my mind anyway) is Augustiner, followed by Paulaner. Make sure to find beer gardens owned and operated by these breweries in Munich – like Augustiner Keller or Paulaner Bräuhaus – to sample their brews. 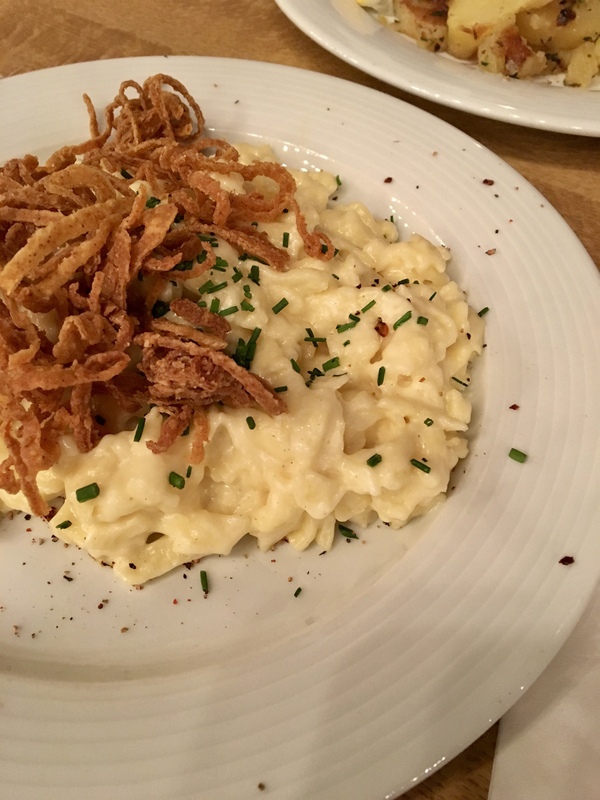 One of the most delicious dishes to eat in Munich is kaesespaetzle. It’s like German/Austrian mac and cheese, made with spätzle, gooey cheese, and frizzled onions on top. You can find this dish at most German restaurants. We enjoyed it with beer at Augustiner Keller, the Hofbräuhaus, and Tegernseer Tal Brewhouse. 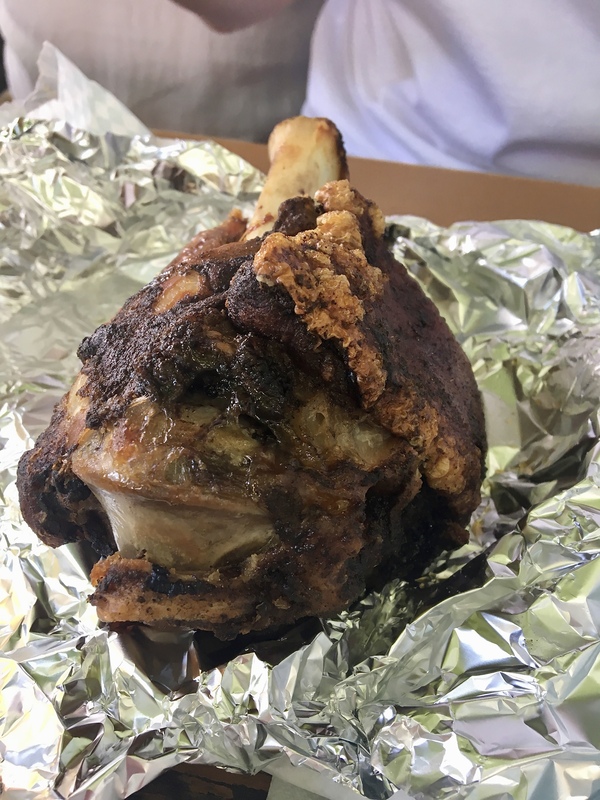 Other delicious German eats you need to try in Munich are pork knuckle, giant pretzels (with beer! 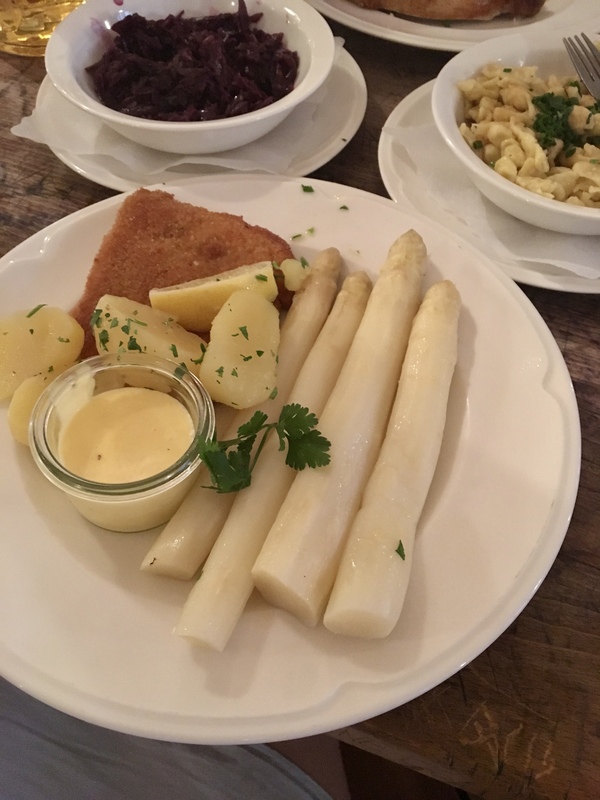 ), sausages (especially Weisswurst, or ‘white sausage’) and, when in season, white asparagus with hollandaise sauce. And speaking of the Hofbräuhaus, you have to go – if only once to experience it. It’s Oktoberfest all year long at the Hofbräuhaus! At Munich’s central market, Viktualienmarkt, you will find all the best food and drink Munich has to offer. There are all kinds of different stalls selling everything from fresh sausages and salami to seafood. 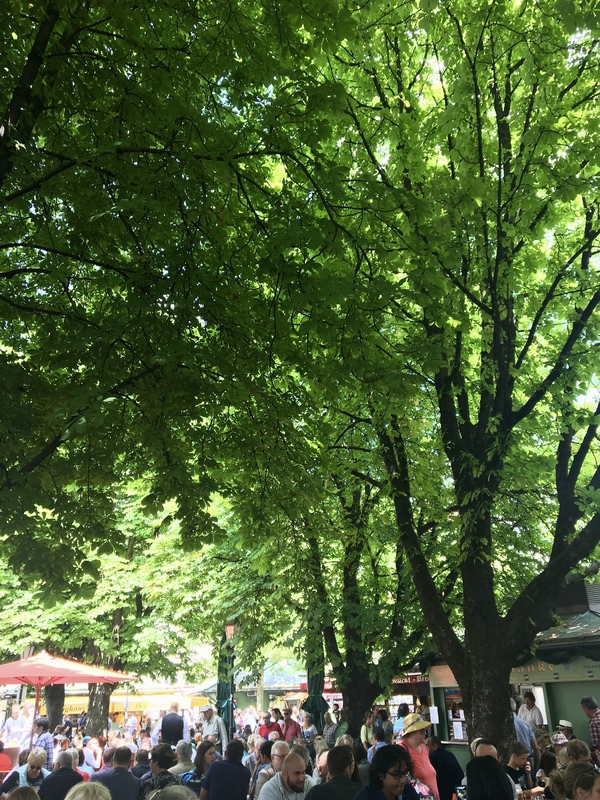 Located under towering chestnut trees, it’s a wonderful, shady place to eat and drink. 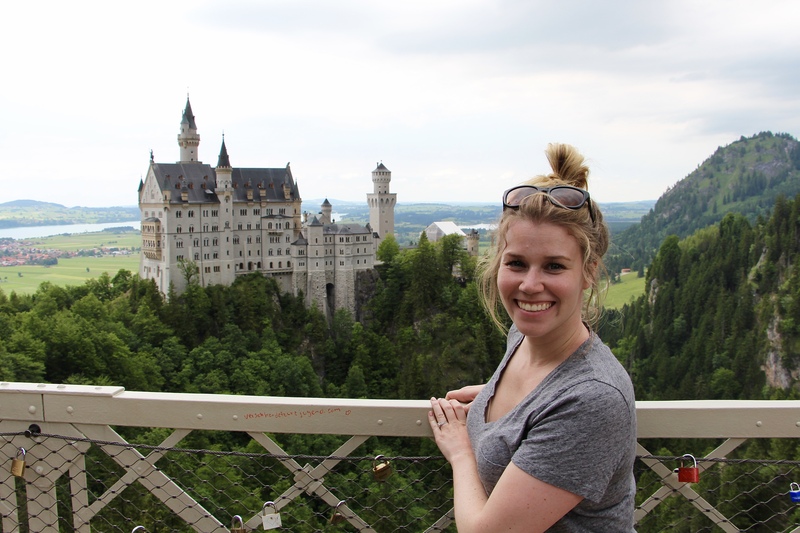 Visit the fairytale-like Neuschwanstein Castle, and nearby Hohenschwangau Castle for magnificent scenery in the Bavarian Alps, as well as to learn about the life and history surrounding King Ludwig II. You can book tours that take you to the castle, or you can take the train and experience it on your own schedule. We experienced it on our own, but a great tour company I would recommend for tours of Neuschwanstein Castle and throughout Munich is Mike’s Bike Tours. However you visit, make sure to wear comfortable shoes and take the time to hike up to Marienbrücke (Queen Mary’s Bridge) for fantastic views of the castle below. To learn more about the horrors of the Holocaust during World War II, visit the Dachau Concentration Camp Memorial Site. It’s a somber, and intense place to visit, but it’s also so important to understand what happened during this terrible time in history, and to honour those who were so cruelly affected. 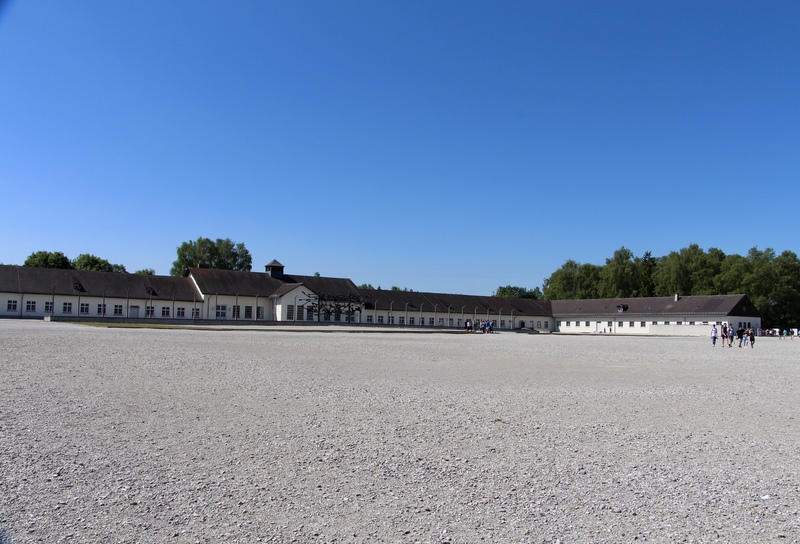 I recommend booking a tour to take you to Dachau to ensure that you receive all the correct and relevant information about the memorial site from an educated guide. We booked a tour with Viator, and found our experience worthwhile and informative. 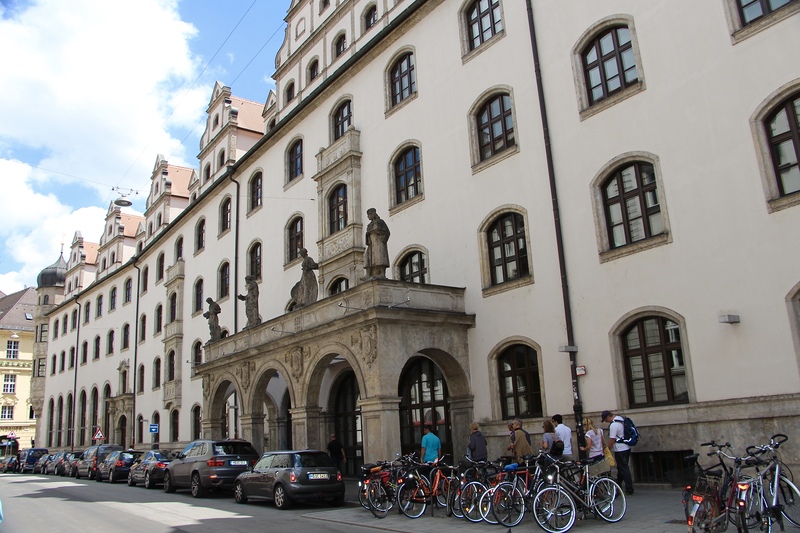 Munich isn’t a large city, but there aren’t many affordable hotels or places to stay in the old centre of the city. A great area to stay is around Munich’s train station, München Hauptbahnhof. 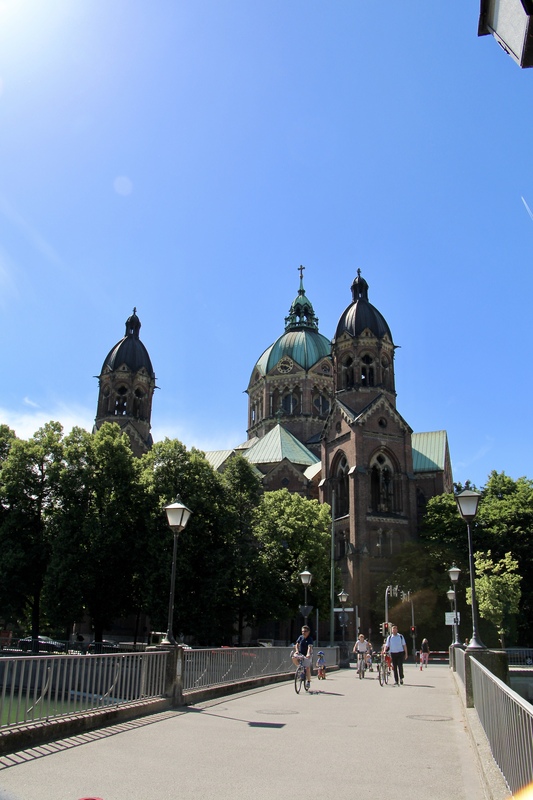 There are lots of hotels and hostels in this area, and it’s very easy to walk to anywhere you wish you go in the centre of Munich, and also easy to jump on the train for a day trip adventure. Cash rules here – especially in beer gardens – so make sure you have lots of euro’s handy! I have been living here for the last 4 years but could never manage to write on Munich. You provide me an encouragement again. Thank you! Morning – trying to plan a trip to Europe for our first time. I have always been interested in Germany. Can you tell me how I can plan an itinerary for 7-12 days – or what you would recommend?. We love to hike, want to see Dachu, castle, etc. Very active 50 yr olds.